solo exhibition co-held with "No Work Work" "Don't Make It"
solo exhibition "No Work Work"
solo exhibition co-held with "Deleted" "Don't Make It"
solo exhibition "Don't Make It"
solo exhibition co-held with "Deleted" "No Work Work"
Takahiro Hirama (1983-), a Tokyo based artist mainly working with art and music, both in unconventional ways, has pioneered a unique direction distinguished with minimum execution of plain ideas in concise designs. Sometimes misunderstood in a hasty conclusion as a retrospective mimicry of conceptual art legacies back in the 1970s, however, his work appears not obedient to those precedents but rather critical and even corrective in pursuit of logical perfection heedless of its consequential but necessary and due tastelessness. In the field of music as his starting point, out of active exchanges among improvising and experimental music scenes in Tokyo, Hirama developed his specific style to "conduct live-recording as a sound performance," which intervenes our "listening" from a particular angle, neither making anything acoustic nor liberating audience to actively "listen to" surroundings. In contrast to intimate silence offered by John Cage's "4:33" that opens and encourages audience's ears, Hirama's silence privileges his recording as the sole "listener" and turns audience from "listeners" to "the listened." For John Cage, who retrieves subjectivity of the audience from the performer by exerting silence to intervene the acoustic of musical performance, Hirama, who in turn subtly retrieves subjectivity of the performer from the audience by exerting recording to intervene the soundless of silence, can be seen as a legitimate betrayer of his method and a legitimate successor of his philosophy. In the field of art, as his new frontier, Hirama instantly established his artistic identity through "Takahiro Hirama Grand Retrospective Show No.1" (at 20202 in Yoyogi, Tokyo), "Marin Mersenne + Jean-Jacques Rousseau as an Anti-Improvising Performance" and "Marin Mersenne Jean-Jacques Rousseau as a Method Music Coming 10 Years Behind" (held together at Loop Line in Sendagaya, Tokyo), and "Supreme Photo Show" and "World Supreme Photo Show" (held together at Akarui Heya [Camera Lucida], Tokyo), all held in the summer of 2010. Since then, he has constantly released his works as a member of New-Method, a collective formed shortly after these exhibitions together with Shogo Baba and Hideki Nakazawa (Nakazawa left the collective and Masaru Kaido newly joined on 18 February 2012). 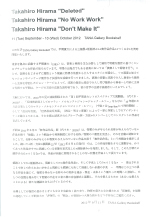 Along with the shift to language-based activities through New-Method email bulletins, Hirama has further explored inquiries into concepts in the realm of "non-object" where he can operate categories and their given properties as the primary ingredients for his work. The upcoming three solo exhibitions "Deleted," "No Work Work" and "Don't Make It" all present Hirama's creation with his recent invention of "no work work," a categorical form of art originally proposed in his "No Work Work Show" held at 20202 in Yoyogi, Tokyo, in August 2011. With "no work work" Hirama offers the antithesis of "untitled" as the category to deal with a work given with its entity and without its name, out of which he discovered a constitutive duality of entity/name in the system of art, thus proposing "no work work" as the category to deal with a work given with its name and without its entity, by exactly inverting the duality. 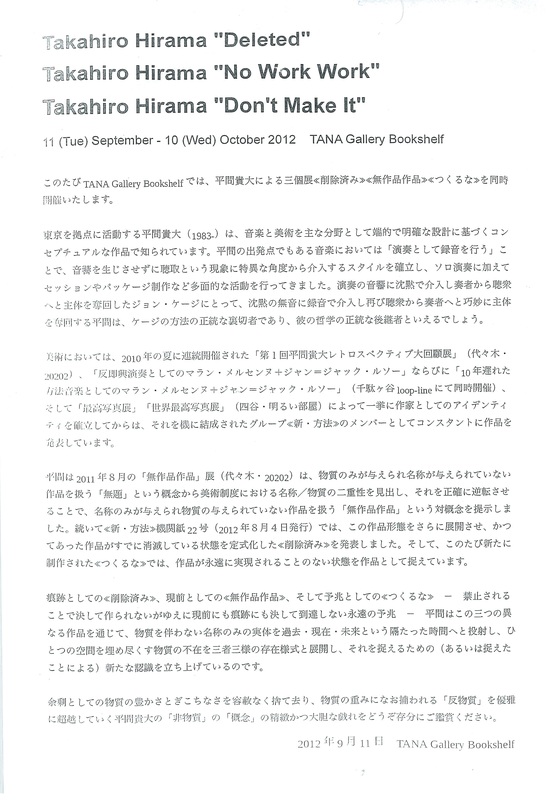 Following this exhibition, Hirama developed this categorical form further and released "Deleted" as another mode of "no work work" in New Method bulletin No.22 (published on 4 August 2011), a work that formularizes a state of "no work work" having once been produced and already disappeared. In the coming exhibitions at TANA Gallery Bookshelf, Hirama will release a brand new work "Don't Make It," a work that captures a state of "no work work" to be never realized as a work forever. Through these three interconnected works, "Deleted" as the trace, "No Work Work" as the presence, and "Don't Make It" as the symptom - a pure and eternal mode of the symptom never attaining to its trace or its presence - Hirama draws a dimension of the time in an abstract level, projecting an existence without substantial entity to the three distinctive time-frames of the past, the present and the future, converting a substantial absence that fills up a space into three unique modes of existence implementing one another, and launching a new epistemology to recognize (or, by the very act of recognizing) such beings. Please enjoy Hirama's bold and precise manipulation of the concept in play with "non-object" that elegantly transcends the anti-object still loaded with its heavy weight and that relentlessly leaves abundance and awkwardness of the excess of the material world far behind.